I swore that I would never post again until I answered every wonderful comment on my last post. I am still well, but I have had a few small complications that kept me from concentrating. I just had to share this birthday wish with you. A dear friend, who shares my macabre sense of humor, sent it to me today. Many kind friends sent good wishes. brought this beautiful orchid and some tasty pastries. We had a wonderful visit as we always do. 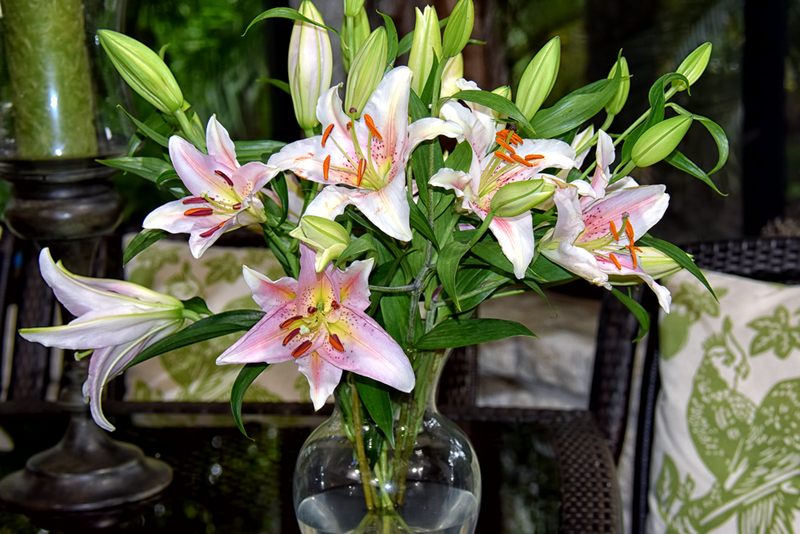 My sister, Linda, sent these heavenly scented lilies that have just begun to open. I love lilies as much as I love orchids, of course, and these are especially beautiful. I expect that it will be my last, but that’s good, too. I have enjoyed a great seventy-three years. I’ve done everything I ever wanted to do. I’ve lived far longer than I ever expected. Blessings to all of my WP friends! Hope that you had a nice bday. Lovely flowers & Oh – that cake. Belated Happy Birthday …. I for one am glad you’ve lived this long as it has given me a chance to get to know you through your blog. I feel lucky to know such a funny, warm-hearted person! I hope you ate the pastries and not the orchids. Best wishes. May this message reach you across the web . Your strength of self is wonderful to behold. Happy birthday! And best wishes. Belated happy birthday! Of course, as we crawl up the numbers, we get to celebrate these events for longer and longer. Like for a year at a time? Silly you, thinking you have to respond to every single comment. I’m sure I’m not alone in just being happy to find out that you’re still kicking up a storm and taking beautiful pictures and laughing at life and death. Happy Birthday, George—you’re not done yet! Happy belated birthday, George! Glad you had such a nice time. Beautiful flowers. So sorry I haven’t been up to date on what is going on! All of your posts have been going into my spam. You’re truly a remarkable woman George! Happy Birthday, George. I’m so glad I’ve gotten to know you, virtually! Happy Birthday George!! Loves to you. Can’t say I embrace the cake…let me be the odd man out….glorious photos too! Oh those flowers are lovely! I hope that you’re embracing equally-lovely bouquets this time next year and the next.. and the next! I am glad you had a happy birthday–you approach it with the three Cs– clarity, composure and courage. Sending you best wishes, hugs, and good thoughts. Special birthday wishes to you, George! Peace and love to you! I’m so glad you had a great birthday; all the flowers are beautiful but that CAKE is really the crowning touch. I’m very curious about who sent it! Sounds like you are having a lovely birthday treat – cake, beautiful flowers and friends visiting. Enjoy the rest of your day George. Man what a wonderful cake… wish I’d been there to share a piece… Happy belated Birthday and I look forward to next years post from you on your 74th… Keep on hanging in there George, kick the arse of that cancer… Hell I love my ……. (you know what,) it is a real blessing for me….. Thanks for hanging around with us for your birthday, George. Happy Birthday and for this gift of having you with us. Hehe, death is closer than ever. I love that cake! Happy Birthday to you! Good you enjoyed your day! All the best! How good it is to have friends who know just exactly how to relate to us, and with whom we have a common language and the pleasure of humor. My best wishes to you on your birthday. May every day bring you some sort of pleasure. I know you will continue to be vibrant and awake as long as you live. Happy Birthday, George. Been thinking about you. You are so special to us all…WP and beyond. Happy birthday to you, George! Happy Birthday my lovely WP friend. I am so glad to see you had a lovely day.